Every technological jump comes with risks. Particularly in the age of artificial intelligence, the Internet of Things, and machine learning, success lies with the managers who can discern the diamond in the rough, who can implement the right combination of technologies to best influence their people and procedures. For me, the possibilities inherent in integrating technology into the human resources field is thrilling. While others worry that AI will strip the “human” out of “human resources,” I maintain that HR will always center around people; AI will only streamline processes. 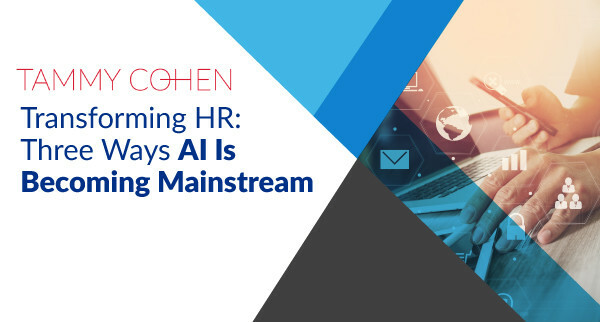 As the utility of AI continues to expand, HR practitioners seek to better understand not only how AI works but, more importantly, how to effectively put it to work for them. Predictive algorithms are transforming recruiting and biometrics are simplifying onboarding. Whether your company is considering the benefits of IoT, gamification, or biometrics, you can put AI to work to best benefit your needs. The benefits of integrating AI and IoT into your company’s culture are unparalleled to any of the technological upgrades of the past. AI tracks employees’ moods, reports on their wellbeing, and calculates peak environments for productivity. Rather than worrying that AI will dehumanize the work environment, companies need to consider how AI will customize programs and personalize the work experience based on the individual needs of each employee. Deloitte reported that one company experienced an 80% increase in productivity after implementing analytical models and IoT devices that predicted downtime. The “quantified employee” will offer extensive data on the state of your employees’ happiness and behaviors. If fully integrated, this technology could drastically impact how we view workdays and workspaces. One study projected that hiring managers spend up to 23 hours sorting through resumes just to make a single hire. When the cost of hiring can top $10K, choosing the right employee the first time is integral to your company’s bottom line. AI has stepped into that conversation by modernizing the search for ideal candidates. Headstart, for example, reduces the time spent on recruitment by 70%. Headstart App combines psychometric testing with algorithmic analysis to match a candidate to company culture. This remedy the reliance on filters and keywords. This technology is also instrumental in overcoming unconscious bias in hiring. Talent Sonar’s machine-learning algorithms analyze and rewrite job descriptions that are gender neutral, creating structured interviews and masking applicants’ personal identifiers. Safe from unintentional gender bias, candidates will all have an equal opportunity based on their skills and experience levels. The best HR teams have a finger on the pulse of every piece of the company they serve. The reality is that the less time spent on responsibilities that could be automated, the more time can be spent on truly focusing on the human responsibilities of your HR team. Automating the mundane tasks allows your team to reclaim their time so they can reinvest in the candidate experience, which TechCrunch predicts is one of the most important facets of an employee’s work experience. The candidate experience is a reflection of your company’s brand, and it begins during the talent attraction and sourcing phases. Much like AI will streamline daily tasks, it will also modernize our interactions with potential talent. With tech like Fama, hiring managers can pinpoint the specific criteria upon which an applicant will be judged. It will remedy the long wait times after submitting a resume. It has already simplified the background screening process, which cuts onboarding times down. AI will have every recruiting system working seamlessly together, transforming the ways we search, engage, and qualify candidates. It’s an exciting time to be in the HR sphere. AI—and all the technology that branches off of it—will find a place in your company. Due to its practical success, it’s inevitable that this technology will make its way to your office. This inevitability changes the conversation from if to why, and it’s a resourceful HR manager’s duty to determine the goals they have in order to source the best uses. Have you implemented this technology in your office or HR department yet? Let’s talk about it—stop by booth 205 at the KNOW Identity Conference in Washington, D.C., March 26th to the 28th.